Ally Legge, grandson of Chafer Legge, son of ‘Boozer Legge’. You will notice that his features are typical of a true Fenman; short, wiry, an eagle-like nose and he had jet black hair. I recall as a youngster that he had many many visitors over the years who would come and talk to him about his life as a fisherman, shooting, netting game and fish and a host of other outdoor activities. 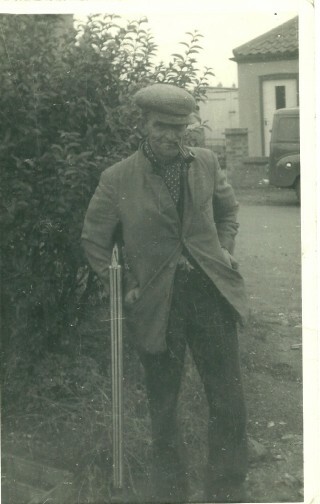 I spent many an hour in the evenings with him when he would be knitting pheasant nets. He and his wife Mary are buried in Southery cemetery. My first recollections of Grandad Ally and Gran Mary were as a three or four year old. I vaguely recall my early start at school, at nearly four years old, mainly due to the afternoon nap we all had on small camp beds aside our class room. Mrs Register was our teacher. Grandad Ally and Gran Mary lived in a disused railway carriage down Common Lane at Southery. I have often wondered what the history of the railway carriage was, where did it come from? How did it reach its destination down Common Lane? I don’t think it was the only railway carriage in the area used as a home, I seem to recall that the Judkin family also lived in one sited between Southery and Hilgay aside the A10. Grandad’s railway carriage stood parallel with the lane, a high privet hedge stood between the lane and the railway carriage. I recall that the home layout was a bedroom at the south end of the carriage, a pantry was at the north end of the carriage and the living area was everything else in the centre and included a cast iron round stove fire some three feet high which had a cylindrical metal chimney going from it which went upward and out the top of the carriage roof. This type of stove was lit by wood kindling and paper and then coal or wood was placed on top for burning. On one occasion (I could have only been five or six) grandad had started the stove fire early in the morning, all his working life he was out of bed around half past five in the morning, and when starting the fire it usually got a little help from some paraffin. I remember some shouts from the living room and we then witnessed flames leaping up from the stove. ‘Do something’ shouted Gran Mary. Grandad did. He got the chamber pot from under the bed and promptly threw it onto the flames. Yes, it put the flames out but the smell was awful and lingered for a days. It was often a story retold in the family and I think later got out to the village folk. At the rear of the railway carriage was an open area of rough ground and grass and at the bottom of this area were wooden sheds. I guess grandad kept various working tools stored there and I do remember him shooting rats at night with a four ten double barrel shot gun at the back of the railway carriage. I must have been born in the railway carriage and lived there with mum for a time until mum bought an old two up two down house opposite which I remember being told was bought for £100. Mum married at 17, dad was 19 which must have been at a time when he was home on leave during the Second World War. Mum and Dad’s marriage certificate classed mum as a Land Worker and Grandad Ally as a Smallholder. Grandad Ally farmed about six acres of land immediately opposite the railway carriage and also farmed six or seven fields, about a hundred acres, at a place known as the decoy some three miles from Southery off the Feltwell Road. I remember each farm location had a small wooden farm shed with a galvanised roof, one location was known as ‘Stamps’ which was towards the Wissington Sugar Beet Factory and the other location was known as ‘Sam’s Yard’ close to the ‘old decoy’ and wooded area which included an old man-made ‘duck decoy’. Opposite Sam’s Yard was the Gamekeepers Cottage and it was here that in my early days of going with grandad Ally to his fields that the concrete road ended and became a Drove which was just compressed earth. At the junction of the Feltwell Road and the Decoy concrete road, a pumping station was sited aside Sam’s Cut. Fenland tales and a medal for a noted liar.